The elderly can be more susceptible to depression for many reasons. Physical changes associated with age, a greater number of diseases - sometimes concurrent - as well as isolation and neglect can trigger depression in this particular group. The loss of friends and family is often devastating and can leave an elderly person with few, if any, links to the outside world. 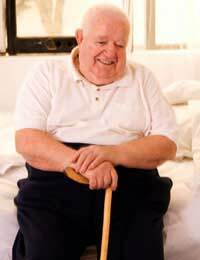 The higher incidence of diseases such as osteoporosis and arthritis can aggressively challenge an elderly person's mobility, which makes it difficult for them to go outside, exercise and socialise with friends or family. Diagnosing depression in the elderly may also be more challenging because the symptoms of depression can mimic those of other conditions such as Alzheimer's disease. Treatment varies but it may involve antidepressant therapy, which can help to regulate the brain's neurotransmitters. Care must be taken because of drug interactions with other medications that an elderly person may already be taking for a health condition. In addition, counselling and similar forms of therapy may be helpful outlets for a depressed elderly person. Furthermore, it's important for the elderly to deal with any social isolation. In this sense, the community plays a strong party in identifying those who may be socially isolated as well as encouraging forms of interaction and communication. For some elderly persons, an activity as simple as watching television can be enough to provide stimulation with the outside world. There are also community volunteers who can provide home visits, which allows an elderly person to obtain weekly companionship. Many elderly will likely find that a combination treatment approach works well, where medication, counselling and social activities improve their mood, physical wellness and outlook on life. The elderly can, however, take more time to respond to treatment but if treatment remains consistent and regular, most will eventually obtain positive and successful results. Treatment may also need to be ongoing even after symptoms abate, because this can prevent the risks of depression recurring. Depression is painful and difficult for a person of any age, but the unique challenges, circumstances and symptoms shown by the elderly mean that special care must be taken to diagnose and treat the disorder. If you are concerned that an elderly loved one is depressed, consider helping that person to make an appointment to see a doctor. Your attention and care can be the gentle nudge needed to help them get back to enjoying the rest of their life.